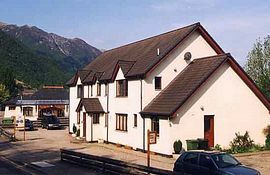 We are a family run, Three Star, Scottish Tourist Board registered guest house, situated in the Highland village of Ballachulish. Set on the shores of Loch Leven and only one mile from the majesty of Glencoe, Ballachulish makes an ideal centre for exploring much of Scotland's natural beauty. 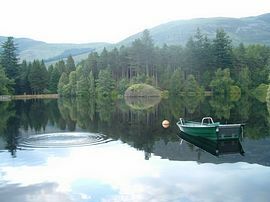 Attractions in and around Glencoe, Fort William, Oban, Skye, Mull, Loch Ness, Loch Lomond and many others are easily accessible. Imposing craggy mountains, beautiful lochs, waterfalls and forestry can all be found locally and wildlife such as seals, dolphins, otters, deer, pine-martens and eagles thrive. There are a mulititude of beautiful and interesting walks from strolls to view the historic isles of Glencoe or around the Lochan trails to mainland Britain's most challenging mountain ridge -- Glencoe's Aonach Eagach (The Notched Ridge). 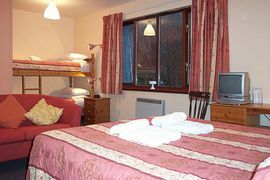 We have a mixture of family, double, triple and twin bedded rooms (single occupancy also available on request). Some of our rooms can also accommodate an extra 'fold up' style single bed if this is more appropriate for your requirements. All of the rooms benefit from en-suite shower and toilet facilities and all have individually controlled heating, colour TV and DVD player, hairdryer and hospitality tray for tea and coffee. We have a comfortable Guest Lounge with maps and walks, guide books, magazines & novels for you to enjoy. There is also a large selection of DVD movies, a well-stocked mini-bar facility and several toys and games for children. Strathassynt Guest House also enjoys full Corporate Membership at a nearby luxury hotel. This enables our guests to use the facilities, which include access to a heated swimming pool, jacuzzi, sauna and gym. Other facilities include a Large Car Park, purpose built Drying Room, Secure Bicycle Storage and availability of Cots, High Chairs & Baby Listening Devices. Our aim is to provide you with a warm welcome and to make your stay a real "home from home" experience. Access to Leisure Facilities including swimming, sauna and gym. DVD Movies & Mini-Bar Facility available from Guest Lounge. We are very easy to find in the village of Ballachulish just off the A82 and right next door to the Tourist Information Centre and opposite the village Pub. Follow the A82 through Glencoe until you see the slip road on your left hand side for Ballachulish. Take this road in to the village and you will find us as the first Guest House that you see about 150 metres along on the right hand side. Follow the A82 from Fort William for about fifteen miles until you see the turn-off on your right hand side for Ballachulish. Take this road in to the village and you will find us as the first Guest House that you see about 150 metres along on the right hand side. 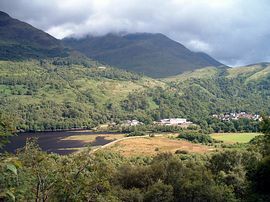 The nearest train station is at Fort William, about 25 minutes by bus from Ballachulish. For train timetables, see the First Scotrail website. 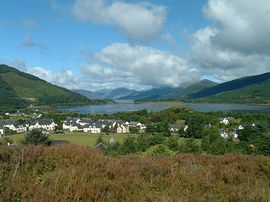 Several CityLink buses stop in Ballachulish about 200 metres from the Guest House. Alternatively just ask the driver to stop at the Tourist Information Centre right next door. Very Comfortable. Everything First Class. 5 Stars ---- Mr & Mrs M. Wonderful night, Delicious breakfast, lovely people. The best B&B ever!! ---- Mr & Mrs G. Excellent B&B & a great welcome. Highly Recommended --- Mr & Mrs C. Super!! Everything you want and a little bit more. Thank You --- Mr & Mrs T. Superb B&B. Mike & Christine really know how to look after you --- Mr & Mrs W. What a wonderful place to stay. Would recommend to anyone --- Mr & Mrs D. The best B&B we have stayed in --- Mr & Mrs E. 1st Class Area, 1st Class Guesthouse & 1st Class People. What more can we say! Thank You --- Mr & Mrs N. Lovely food, company, surroundings and facilities. Wish we could stay longer --- Mr & Mrs J. Thank you so much! Perfect! Will definitely come back in the future --- Mr & Mrs M.